It's one of our favourite festive days today; Christmas Jumper Day! What are you wearing? 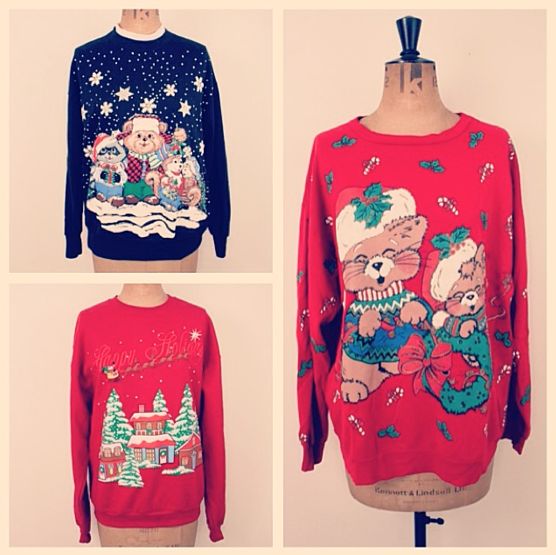 A trio of vintage Kitschmas jumpers. It might be Friday the 13th, traditionally unlucky for some, but here at Thrift-ola Towers the festivities have been cranked right up to celebrate Christmas Jumper Day. I’m packing all your orders today wearing my most kitschmas jumper, with festive tunes a-playing and the promise of a mince pie or two once I’ve been to the post office. We have just one vintage kitschmas jumper left in stock which can be snapped up here and if you buy in the next few days you can still get it in time to wear on Christmas day. Hurrah!